The wind spun round to the south today at Stena Match Cup Sweden altering the game plan for the final 5 flights of Stage 1 of the event. For some of the smug skippers of the World Match Racing Tour, Marstrand is their home of old and they therefore take clear advantage in the race course knowledge stakes. 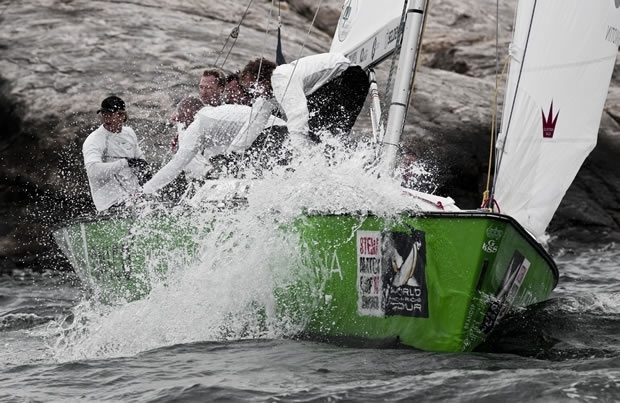 The change in wind direction enforced shorter legs to races with three rounds as the teams tracked the cutting gusts through the rocky outcrop of the archipelago. Sweden’s tortuous round robin slaughtered the bookies’ favourites with Adam Minoprio, winner of this year’s Match Race Germany and Yanmar Racing's Peter Gilmour, who claimed victory only 10 days ago at Portimão, out for the count along with Björn Hansen, Finland's Staffan Lindberg, Johnie Berntsson, Reuben Corbett, Keith Swinton losing all of his matches along with Mattias Rahm of Stena Bulk Sailing Team, winner of Stena Match Cup Sweden two years ago. The quarter finals are now consolidated down to eight skippers with Ian Williams of Team GAC Pindar and Denmark's Jesper Radich winning each of their groups. Radich will be first to pick his opponent for the quarters which is a huge psychological boost as he gets to select his jousting partner out of WMRT leader Mathieu Richard, Azzurra's Francesco Bruni, Williams, Damien Iehl, Torvar Mirsky, TeamOrigin's Ben Ainslie and Magnus Holmberg. The bookies’ favorite for a podium position at all the 2010 Tour events and last year’s overall World Champion, Minoprio, booked a taxi to the airport earlier today flying out after an unfortunate blood bath at Stage 5 with his team winning only three matches. Gilmour has also been sliced and diced after two days. Chomping at the bit to get out this morning and knowing he had to win all three races to carry on into the quarters, Gilmour seemed confident that the strong breeze and change in direction would assist his team as he is uniquely qualified to provide analysis having won seven previous events here, “There are some major secrets to this wind direction with good geographic shifts, different things happen and there is quite a set pattern but it takes a while to work it out”. Holmberg offers the surprise scenario just squeezing into the final 8 at 4-3 after a jaw dropping finale to his day. Corbett led their 'winner goes through' final match for five of the six legs but a wobble under pressure down the final run, gybing in front of Holmberg and picking up a penalty, gave Holmberg’s young Kiwi team the opportunity to stamp down fellow New Zealand nationals on Corbett’s Black Sheep Racing Team and take the win, propelling them to the quarter finals, much to the delight of the local crowd. Holmberg has raced every edition of the Tour’s Swedish leg to date, “We managed to slip through in the very end and now need to shape up some more. It’s difficult here every day there are new conditions and if you make a few mistakes you are out”. Quoted yesterday as definitely wanting a Tour card next year, this iconic match racer is prized to fight. Having returned to the WMRT this year, Radich is hunting a first in Sweden this Sunday after finishing second in May’s Match Race Germany but was quick to point out his niggling mistake of having controlled Lindberg in the pre-start then allowing the Finn take advantage of the shifting winds and slip past him, “We did amazingly well in this first round considering that this team has only sailed together now for 6 days. It’s too early to talk about final results yet but I think we can do really well here”. Radich is now looking through the list of skippers he needs to pick from this evening and finished with a final comment, “We have a lot of worrying ahead of us I think”.